For the third year, Praxair, Inc. has helped support SystemsGo’s high school STEM program by providing fuel for rocket launches at three sites and more than 60 high schools. L-R: Rebekah Hyatt, Program Director of SystemsGo; Brett Beorema, Praxair’s Director of Global Project Procurement; Scott Netherland, SystemsGo Executive Director; Gene Garrett, President of SystemsGo; and Chris Granger, General Manager for Praxair Distribution, Inc.
June 2018–For the third year in a row, Praxair, Inc., a global industrial gas company based in Danbury, Connecticut, has supplied the rocket fuel for all SystemsGo rocket launches. 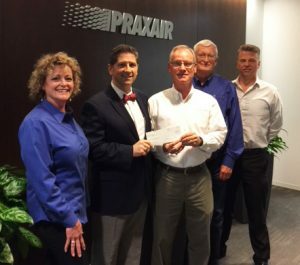 Scott Netherland, SystemsGo Executive Director, originally reached out to Praxair’s Brett Boerema, seeking support through their Global Giving Program. “Their program is focused on STEM education, so I thought it might be a good fit with SystemsGo, a project-based high school curriculum that focuses on Science, Technology, Engineering and Math (STEM),” Netherland said. Chris Granger, the General Manager for Praxair Distribution Inc., for the Western Gulf and South Regions, has taking the point for orchestrating the nitrous supply, used in launching the student-built rockets. Praxair is a nation-wide supplier of compressed gas products and is also in over 50 countries worldwide. SystemsGo is a Fredericksburg-based education non-profit that provides an innovative rocketry/aerospace curriculum to more than 50 high schools in Texas, New Mexico, Oregon, and Utah. These student-designed and built rockets are intended to accomplish one of two missions: to take a one-pound payload one-mile-high, or to break the speed of sound. Upper level students attempt to loft a scientific payload to 100,000 feet with launches in partnership with the U.S. Army at White Sands Missile Range. Information on the rocket launches and the SystemsGo program are available at www.systemsgo.org or by calling 830-997-3567.